FANNIE SCHIAVONI is a London based womenswear label established in 2009. Born in Sweden, Fannie moved to London at the age of 18 to study tailoring at London College of Fashion, where she later progressed to the BA (Hons) Fashion Design Womenswear course. 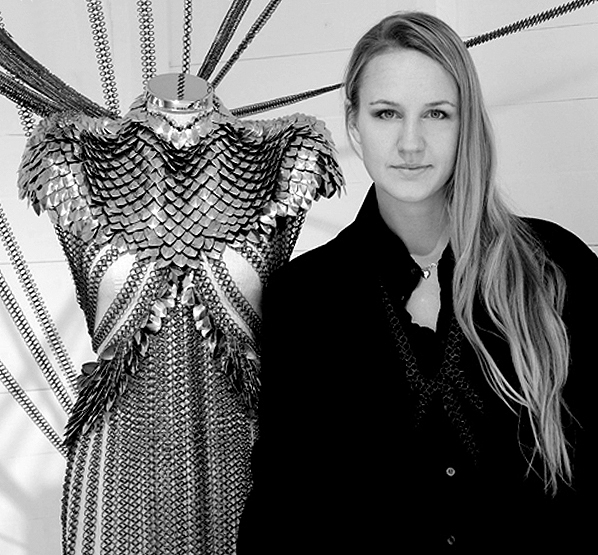 Having completed a number of internships alongside her studies for designers including Hussein Chalayan and Giles Deacon, she launched her first collection before graduating in Spring 2009. Browns Focus bought the eponymous collection and in the same year, she received the prestigious NEWGEN Award from the British Fashion Council. She continued to receive the award for three consecutive seasons. FANNIE SCHIAVONI is currently stocked internationally in leading retailers including Moda Operandi NY, fwrd.com, Curve NY/LA, 55 Croisette and MC Market Monaco. Revered globally by press and buyers alike, her designs have also been embraced by high profile artists including Rihanna, FKA Twigs, Alicia Keys, Bella Hadid, Lady Gaga, Miley Cyrus, Cher and Katy Perry. As well as featured in magazines such as Vogue Italia, Harpers Bazaar US, W Magazine, Interview Magazine US, 032c Magazine and Vogue Japan. Notable collaborations includes designers Alexandre Vauthier and Matthew Miller, as well as commissioned one-off pieces for Rihanna, Interview Magazine, Lane Crawford and Diesel Art Gallery. All FANNIE SCHIAVONI pieces are made by hand in our atelier.